Hatsune Miku, the loveable anime poster girl for the synthesizing music program known as “Vocaloid” has become an international sensation. She returns to us again in yet another video game (As we can all recall, she was in Hatsune Miku: Project Diva and Hatsune Miku: Project Diva 2nd, along with a few others). What we are going to be getting here in the “West” (I am unsure if they are talking about releasing the game in North America, Europe, or both) is essentially a remix edition of Hatsune Miku: Project MIRAI 2 and will be the first time that Miku will be on a Nintendo platform outside of Japan. You can catch the full press release for Hatsune Miku: Project Mirai Remix after the jump. 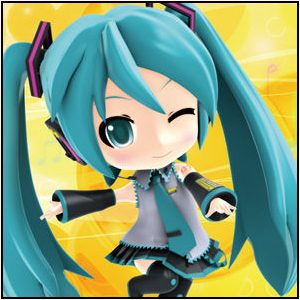 SEGA® of America, Inc. and SEGA® Europe, Ltd. today announced that Hatsune Miku: Project MIRAI Remix (working title), an enhanced version of the popular Japanese video game Hatsune Miku: Project MIRAI 2, will launch in the West on Nintendo 3DS in 2015. A fan favorite franchise, Hatsune Miku: Project MIRAI Remix will mark the first release from the Project MIRAI series outside of Japan and also the first appearance of Hatsune Miku game on a Nintendo platform outside of Japan.